earth,one of the main differences between third world countries and highly developed countries is the level of education and technological advancement. In this article we are going take a quick look at some of the top 10 most educated states in Nigeria this year and also list some of the top tertiary institution in these states. Education in Nigeria has been come along way since independence,a lot of states in Nigeria seem to be making gradual progress towards education, however the reverse seems to be the case with states in the north,where in most cases there is still a high level of illiteracy. The problem in the north doesn't seem to be tied to poor funding as the federal government has given over 153 billion to the 19 states in the North and N115billion to the 17 states in the South between 2005 and 2016. Northern states has continued to record a high level of illiteracy level as majority of northerners cannot read or write,for example Yobe State has only 7.23 per cent literacy level, which is the the lowest in the country,however the most educated state in Northern Nigeria is Taraba State with a 72 percent literacy rate. 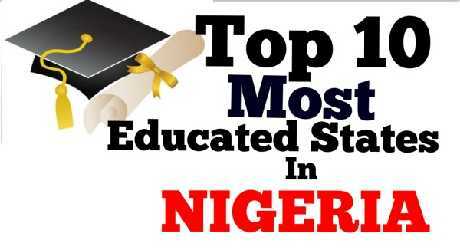 Listed below is the list of the top 10 most educated states in Nigeria this year. Imo state is ranked as the most literate and educated state in Nigeria with a 96.43 % Literacy level. Some of the notable schools in Imo State include:- Imo State University,Imo State Polytechnic,Federal University of Technology Owerri,Federal Government Girls' College, Owerri,Eastern Palm University. The 2nd most educated state in Nigeria is lagos state with a 96.20 % literacy level,apart from being the economic powerhouse of Nigeria,Lagos state has also invested properly in it's education sector. Some of the popular schools in Lagos include:- The University of Lagos,Lagos State University,Yaba College of Technology,Lagos City Polytechnic. The Garden city is also one of the highly ranked educated state in Nigeria. The literacy level in this state is 95.76% making it the third most educated state in Nigeria. Some of the schools in Rivers state include:- Rivers State University,University of Port Harcourt,Port Harcourt Polytechnic,Rivers State College of Health Science and Technology. Abia State is another south eastern state with a high level of literacy in Nigeria. Abia state has a 94.24% literacy level and is ranked as the 4th most educated state in Nigeria,some of the popular schools in the state include:- Abia State Polytechnic,Michael Okpara University of Agriculture. Holding down the 5th position of the top 10 most educated states in Nigeria is Anambra State. This state is known for nurturing successful entrepreneurs. Anambra state has a 92.11% literacy level,some of the popular schools in the state include:- Nnamdi Azikiwe University,Anambra State University,Madonna University, Elele. Osun state is ranked as the 6th most educated state in Nigeria with a 90.57% literacy level out of 100%. Some of the popular schools in the state include:- Osun State University,Osun State Polytechnic,Bowen University. The state is ranked as the 7th most educated state in Nigeria with a 90.53% literacy level. The Igbenedion University okada which was the first private university in Nigeria was founded in the state. Some of the popular schools in the state include:- University of Benin,Igbinedion University,Okada. The coal city state is one of the states in the east that has invested in education as there are several community primary and secondary schools in the state. Enugu state is ranked as the 8th most educated state in Nigeria with a 89.46% literacy level,some of the popular schools in the state include:- University of Nigeria, Nsukka,IMT Enugu. Cross River state is ranked as the 9th most educated state in Nigeria this year with 89% literacy level. Some of the popular schools in the state include:- University of Calabar,College of Health Technology,Cross River University of Technology. Ogun State is one of the most educated states in Nigeria,some of the popular schools in the state include:- Federal University of Agriculture, Abeokuta,Covenant University and Babcock University.